There is a Giveaway and a lovely 4.5 Star Review for A Very Darcy Christmas at From Pemberley to Milton. Rita writes, “This is a very entertaining book full of laughter and holiday spirit but it can be read at any other time of the year. It is funny, romantic and up to the standards Mrs. Kincaid already got us used to. 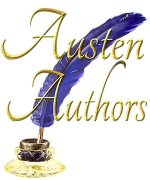 She marvels at adding humor to her stories and yet keeping true to Jane Austen’s characters, and A Very Darcy Christmas is vivid proof of her proficiency in this type of stories.” Thank you, Rita! 4.5 Star Review for A Very Darcy Christmas! Two Giveaways for A Very Darcy Christmas! Here’s an excerpt from the beginning of A Very Darcy Christmas, now available for pre-order. It will be released on Amazon on Nov. 27th. Disdain dripped off every syllable Giles uttered. Elizabeth pretended not to notice. Every day Pemberley’s butler demonstrated that he did not approve of the upstart country lass his master had married. In the months since William had brought her home as his bride, Giles’s friendliest tone of voice could be described as frosty. On the other hand, Mrs. Reynolds, the housekeeper, and the majority of the other staff had been most welcoming. Elizabeth rushed to her feet. Her parents should be safely ensconced at Longbourn for the Christmas season. What could have brought them to Pemberley unannounced? She hurried from her sitting room and followed Giles down the grand front staircase, her heart contracting with every step as she imagined what kinds of evil might have befallen her family. Her mother and father were indeed standing in the hall. Their rumpled, travel-worn attire contrasted noticeably with the grandeur of the room. The inhabitants of Pemberley called it the marble hall because of the black and white marble squares covering the floor as well as the classical statues set in niches along the walls. It was an impressive room, meant to stir amazement in Pemberley’s newly arrived visitors, and from the expressions on her parents’ faces, it was having the desired effect. Elizabeth had been duly impressed when she had first arrived at Pemberley, but now the room reminded her of a mausoleum, grand and cold and forbidding. She and Mrs. Reynolds had recently finished decorating the room with holly, evergreen boughs, ivy, and mistletoe for the yuletide season. The greens softened the room’s sharp edges, but it was only slightly more welcoming. Her father’s careworn face relaxed into a smile when he saw her as if her presence made the unfamiliar surroundings more bearable. He does not seem overly alarmed; perhaps the situation is not dire. However, the moment her mother noticed Elizabeth, she commenced fluttering her hands and breathing rapidly as if she had experienced a terrible shock. In other words, everything was quite normal. Standing by the ornately carved front door, Giles watched this performance with a pinched mouth and lifted chin that left no doubt as to his opinion of the Bennets. The best Elizabeth could do was to treat her mother’s shrieking as if she spoke in a normal conversational tone. She embraced both of her parents. “This is a surprise! I did not expect to see you so soon. Is something wrong?” She searched their faces for signs of agitation. Had something happened to one of her sisters? “Everything is well,” her father assured her. “There was political unrest in the North,” Mr. Bennet murmured. “Mrs. Long does not believe it,” Mrs. Bennet said with a dismissive nod. “And what is more, Mr. Long does not believe it. He was in the militia for a year in his youth and said such orders were highly irregular. Her words continued unchecked. “An invasion is imminent. Nothing you may say can convince me otherwise.” She folded her arms across her chest. Elizabeth feared this was the truest statement her mother had uttered since arriving. Having never considered this a feature of her marriage to William, Elizabeth did not respond. Elizabeth gave her father a helpless look, not knowing where to start unraveling her mother’s convoluted reasoning. Mr. Bennet offered her a defeated shrug. Apparently he had given up on reasoning with his wife. “They make the house more festive,” Elizabeth replied. “But it is bad luck to hang greens before Christmas Eve!” Her mother’s eyes were round with concern. “Just a superstition—” her father interjected. Giles’s expression could not possibly have been haughtier, but he gave a slight bow and left to summon a maid. As the maid led Mrs. Bennet up the stairs, the older woman warned the wide-eyed girl about the imminent French invasion. Elizabeth and her father fell behind, staying out of earshot.